Last week, I entertained our preschool crowd with a program on The Nutcracker ballet. 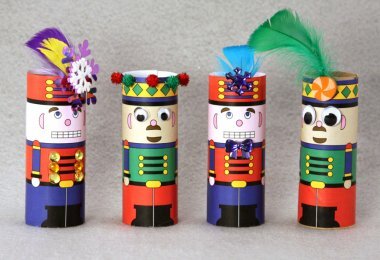 Now, the story behind The Nutcracker is actually a little complicated for four year-old brains and attention spans so I had a bit of a challenge in presenting the story. However, I was really excited to host a program that centered on dancing and not just a book and a craft as many of my programs for this age wind up being. 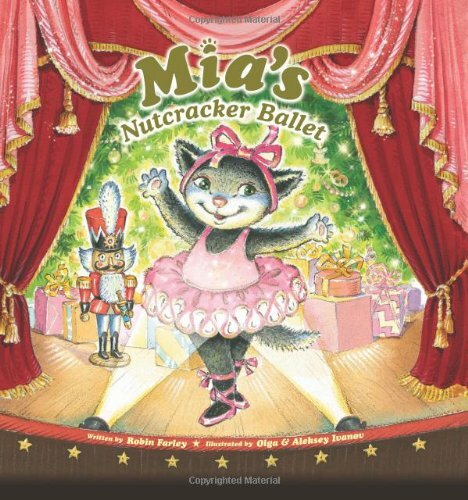 The book frames it’s retelling of the story by including a few pages about Mia’s family gathering around to listen during Christmas festivities. I skipped all those pages and only read the bit with the retelling, which was still a big chunk of the book. There’s an enormous variety of recorded dances from the Nutcracker Suite and all of them have choreography that’s a little different. Basically, I looked for ones with good visual quality and appeal and a few moves that I could easily re-create for three to five year-old motor skills. After that bit of excitement, I calmed everyone down and sent them to the craft tables. One table was set up for quickly constructing a crown from wavy bulletin board liner. Poms poms, feathers, and jewels optional. Fun was had by all. After about ten minutes of free-crafting, I noticed some children were finished so I turned on our Sugar Plum Fairy video for everyone to watch and enjoy. It also gave the other children the hint that there was more dancing to follow. After our Sugar Plum Fairy video was finished, most of the children were gathered in the empty area of our room, waiting for another dance. I turned on the Russian dance video and I focused on showing them how to jump out like a jumping jack, bounce low on their heels, and use that chopping/windmill motion. The boys in the room loved this one. Actually, I should mention that we had more boys than girls in this program (6 boys, 4 girls). That’s why I chose to focus on dances with more gender-neutral moves. After the Russian dance, I played the Waltz of the Flowers video and let them all free dance. One girl was taking dance lessons and was kind enough to treat me to a lesson herself. When we wrapped up, I noticed even the adults in the room had a little more joy.